The screenings of the film "I, Daniel Blake" in the Little Theatre on Friday evening and yesterday afternoon were sold out and from the suggested donation of £5 per ticket plus further donations for teas, coffees and biscuits (kindly donated by the Co-op) over £700 was raised which will be split between local foodbanks. It was a powerful, moving film and many who watched the screenings were visibly affected by the subject matter. If you get a chance to see this film please do - you will come away wanting to do something about issues concerning people in our community going hungry. As one of the organisers said at the end of the Saturday afternoon showing: "none of us have the answers but we have to try and do something about this." 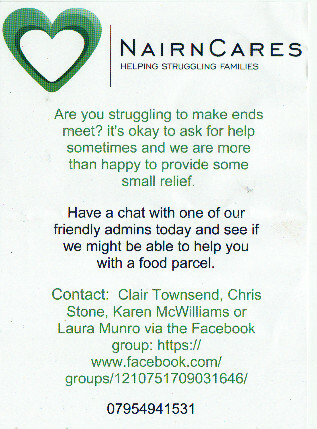 This observer had the pleasure of meeting Clair Townsend, the driving force behind the Nairn Cares foodbank operation. The organisation came into being just before the Christmas period, she made her mind up to help local families who were struggling to have a good Christmas Dinner and made up six parcels. She got 72 requests for help! There's a lot of people struggling in our community and often it goes below the radar. Please think about what you can do to help and it isn't only about food - imagine having to send your bairns to school in shoes falling apart or having to choose between sanitary towels or food? Just two examples from the film of what many people have to endure on a daily basis as poverty grinds them down. If you know anyone that needs help feeding their family the Nairn Cares contact details are on the image on the right and their facebook page is here. The Blythswood shop on Leopold Street sold quite a lot of tickets for the two screenings and they accept a range of dried foods for the Highland Foodbank which has a branch in Nairn. Please do something if you can folks, let's ensure that nobody in our community goes hungry. So many things wrong with the system, from the very start where the single mother and her family are forced to move so far away from London to Newcastle because that's where they are rehoused? The cost of phone calls to the DWP and the length of time taken for a call to be answered(or not) which eats into whatever benefit you might get? The expectation that everyone has access and is able to use the internet; what if you can't go online because you can't afford it, haven't go a computer or are computer illiterate? The possibility of sanctions which could last for years? Why are people still being treated like this, not everyone is a scrounger and none of us know when we might be in this position. We are supposed to be living in the 21st century, this is 2017. What next, the re-introduction of the Poor house? C**** @ 6.37, I take issue with your comment "This this (sic) is what the people of Scotland voted for in 2014 - NO.". This is not what the people of Scotland voted for, this is what some of the people of Scotland voted for. I pray and hope that the people of Scotland are given a second chance and this time - they get it right. If we don't we are truly (in the words of Dad's Army's Pte Frazer) doomed. Thatcher didn't believe in a caring society. The perversity known as UKIP now appears to have become the political "mainstream centre ground " of much of England. One led to the other over the course of 40 years. There are of course many societies - mainly Scandinavian - but also Canada and New Zealand, who have much more positive values than those increasingly evidenced by Westminster. We could, should and must do better. Perhaps "I,Daniel Blake" is a marker for the point in history when our un-reined and unprincipled free market capitalist begins a change for the better. We all know and love folk who could become the Daniel Blakes of this world. When did the Gurn turn into a left wing piece of crap. What a sad individual. The Gurn reports on the BAFTA award winning film and also the generous donations made by many Nairnites towards food banks and all you can do is accuse the Gurn of being a 'left wing piece of crap'. As has already been asked, what other route is open to Scotland to change our society so that we don't have Daniel Blakes? The final amount collected was £860. Well done to all who donated and to the organisers.